• The most recent readings on the U.S. economy show a moderating pace of growth. Both points are worth emphasizing: the US is still growing but at a slower rate than a few months ago. We see support of this statement in the recent nonfarm payroll and ISM Manufacturing report releases. Even at the more subdued three-month average of 167,000 new jobs a month, we will still be net adding jobs above the number of new workers. Likewise, an ISM Manufacturing reading of 50.2 is below where we have been but still signals expansion (above 50). I believe the source of the slowdown is likely the sharp rise in the trade-weighted value of the dollar over the last several months and, to a lesser extent, weakness in the world economy. • I see the weakness in the world economy as stemming mainly from the dislocation of global growth due to a lower level and a changing pattern of economic growth in China. It seems there is excess in the global supply structures that were built up to supply raw materials to facilitate the rapidly expanding Chinese infrastructure growth. Presently, it appears the Chinese government wants to shift growth to be more consumer oriented in addition to adapting to a more modest rate of economic growth. 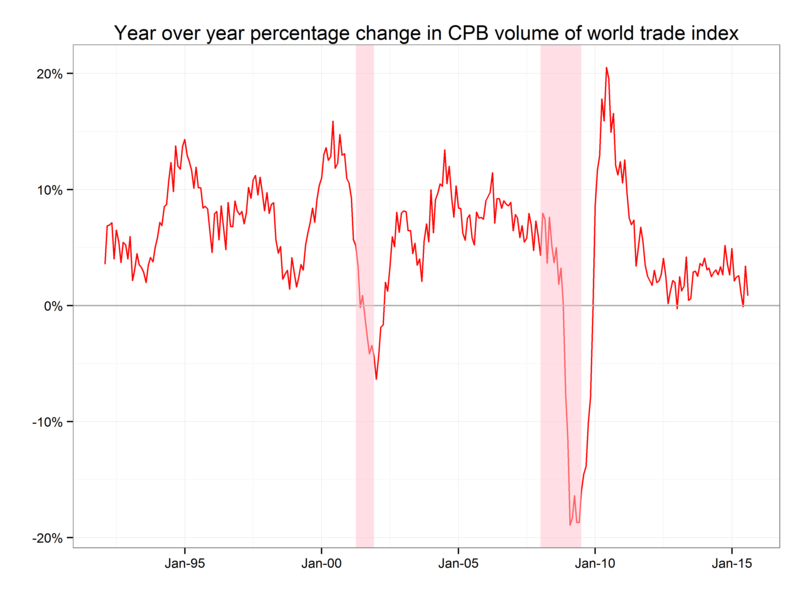 • The chart below shows the year-over-year change in the volume of world trade as measured by the CPB. We can see world trade has been at somewhat lower levels since the global financial crisis and even bearing that fact in mind, the volume of world trade is at low though not crisis levels. • This world trade number is quite thorough, but not as timely as one would like. The chart above is only updated through July. 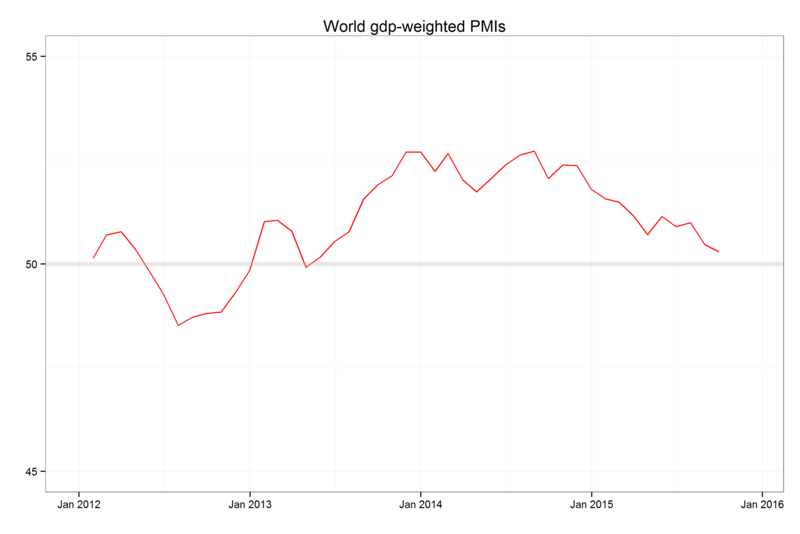 The next chart shows the GDP-weighed purchasing managers indexes of the 20 largest economies for the last few years. This measure looks to have been slowing over the last few months though it does not look like an emergency. Source: Bloomberg, Markit, Astor calculations. • The Federal Reserve refrained from tightening in September though they made a special point to say October 28 is a live meeting, that is saying one in which the FOMC may raise rates. We can be sure there will be a deluge of Halloween related headlines before the meeting. Should we be braced for something more serious? As far as the market is concerned, the FOMC may as well play cards this month as almost no one believes they will raise rates. This belief is because the committee said it is waiting for further labor market strength, but we will not get any additional labor market information before the meeting. 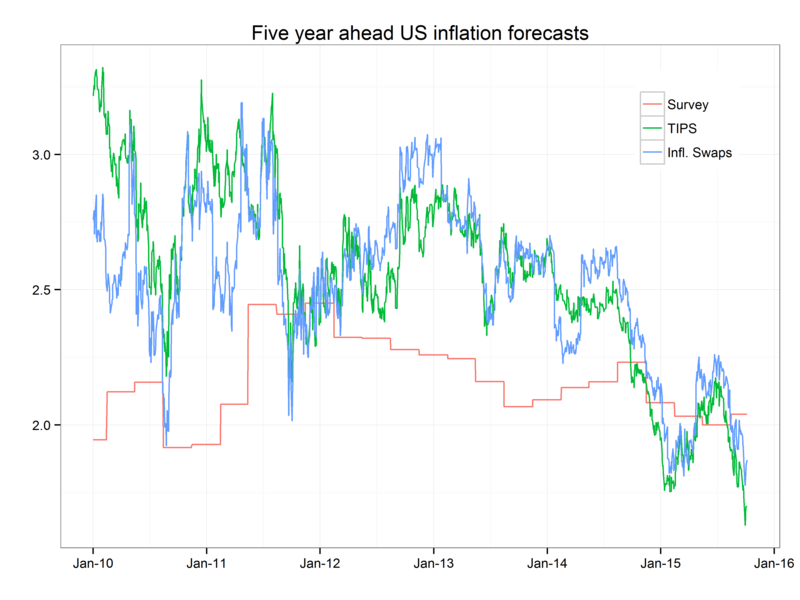 • The Fed is also looking for a conviction that inflation will be heading toward its 2% target in the medium term. How is that side of the Fed’s dual mandate going? The chart below shows three different five year ahead inflation forecasts: the blue and green lines are derived from market prices and the red line is from the Philadelphia Fed’s Survey of Professional Forecasters. • The market based forecasts show marked deterioration this year while the survey has held steady the last few months, though somewhat lower than last year. Various Fed officials have said they are looking through the market measures of inflation somewhat, thinking they may be artificially depressed due to temporary factors. A policy maker with a strong bias toward hiking might be able to square that desire that with current inflation forecasts, but I think holding off would be more appropriate. • Overall, this last month’s data has made us a bit more cautious on the economy, though we do see continued expansion in the U.S. as the most likely scenario.